Get kids excited to collect some deep sea treasure by hanging up this Mermaid Pinata! 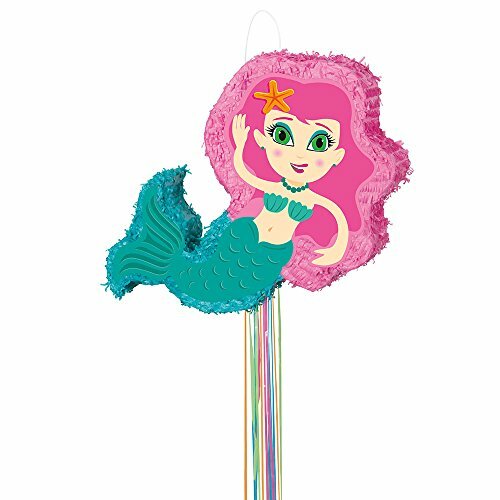 With her cute starfish accessories and vibrant pink hair, this mermaid pinata is sure to make a splash at your daughter’s mermaid birthday party. To get the fun started, first fill this pull-string pinata with candy, favors, and other fun mermaid party supplies (pinata filler not included). Then, hang her from the ceiling or from a sturdy tree branch outside. Finally, have kids take turns giving the hanging strings a firm tug to try and find the one that releases the goodies inside. No whacking required! Be sure to pick up our matching mermaid themed party supplies to make planning your under-the-sea celebration a breeze!.